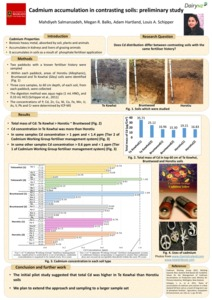 Salmanzadeh, Mahdiyeh and Balks, Megan and Hartland, Adam and Schipper, Louis (2014) Cadmium accumulation in contrasting soils: preliminary study. NZ Society of Soil Science Conference, Hamilton, New Zealand, December, 2014. Cadmium (Cd) is a biotoxic heavy metal that can be absorbed by soils and plants. The amount of cadmium in New Zealand soils is increasing as a result of phosphate fertiliser use. 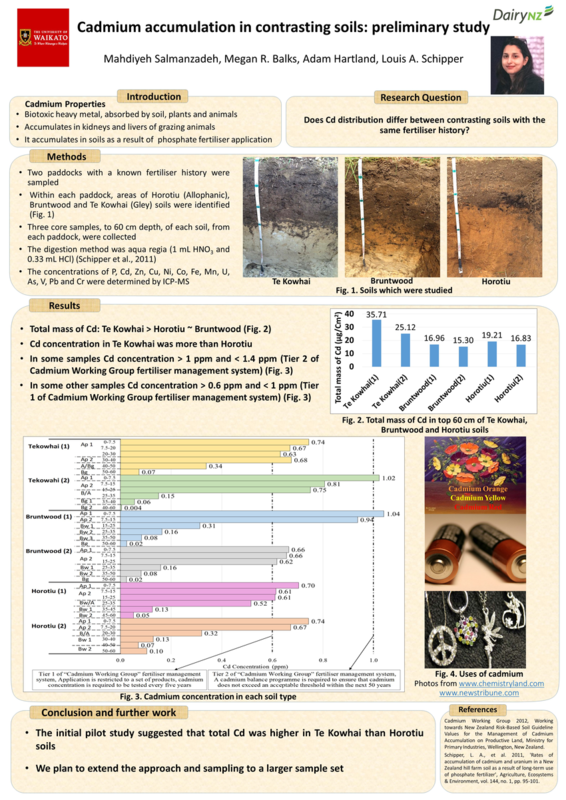 The main question of this research is “does the distribution of Cd differ between contrasting soil types?” The concentration and distribution of Cd in three different soil types: Te Kowhai, Horotiu and Bruntwood will be determined. All three soils often occur in the same paddock, so have the same fertiliser history. However, they have contrasting drainage and mineralogical characteristics. An initial pilot study for the first major experiment has been completed. Two paddocks from a dairy farm near Hamilton (Scott Farm) were sampled to a depth of 60 cm and the concentration of Cd in three soils within each paddock, with varying depth to slowly permeable layer, and varying allophane contents, was determined. Initial results suggested that the total Cd in the poorly drained Te Kowhai soil was higher than in Bruntwood/Horotiu soil. In some topsoil samples the concentration of cadmium was higher than 1 ppm, and therefore according to the Tiered Fertiliser Management System, Cd application is required to be managed by a Cd balance programme to ensure that Cd will not exceed an acceptable threshold in the next 50 years. Cd and P correlated strongly, which supports the assumption that Cd was mainly derived from phosphate fertilisers.